This surge protector features most advanced Quick Charge 3.0 technology, bringing you fastest charging experience. 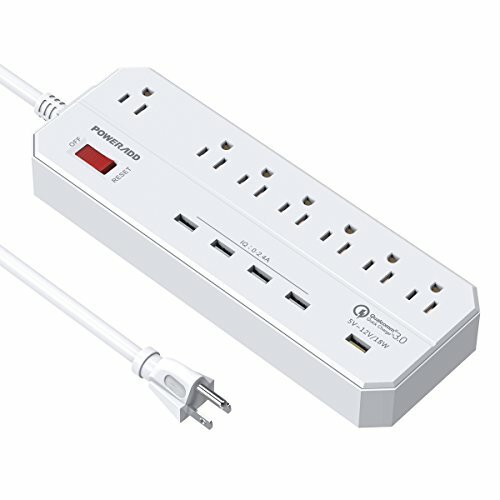 - 7 outlets surge protector is perfect for desktop, network, high-end home application and professional workstations. - 5 USB charging ports for iPhone, iPad, Samsung,smartphone, tablet and other USB-powered devices. - 6ft 16-gauge power cord allows you to keep the power strip in an unobtrusive location which making sure it reaches your devices. - The spacing of the 3-prong ports is thoughtful as well as it dedicates two outlets for bulky wall adapters. - Lighted on/off switch with integrated circuit breaker provides power control over connected equipment. - AC suppression rated at 900 joules shields equipment from surges and line noise. The latest, fastest and most efficient USB charging technology; up to 4X faster than standard ones, able to charge compatible devices up to 80% in just 35 minutes. Compared to QC 2.0, QC 3.0 has 15% greater charging efficiency, charges up to 27% faster, and reduces power consumption by up to 45%. Use original cord will protect your device effectively. Keep the power strip away from children, fire, heat, water, damp. Avoid beating and crashing the power strip. Please stop use once the power strip extreme heat.